With healthy appreciation in housing prices in most residential pockets, the realty atmosphere in Delhi NCR seems to be improving. Micro-markets of Greater Noida, Bhiwadi and Dharuhera have recovered from last quarter’s dip and so have most localities in Delhi. This growth is seen as a result of key policy announcements and stability of new governance at the Center. 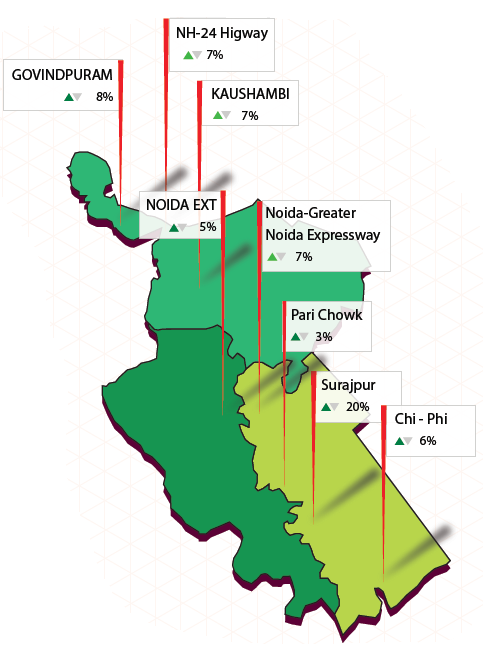 Surajpur in Greater Noida topped the ROI charts for Delhi NCR in Oct-Dec 2014 with 20 per cent increase in the capital value of residential apartments. This was followed by Sector 31 in Gurgaon and Mayur Vihar III in East Delhi with an appreciation of 18 per cent each. 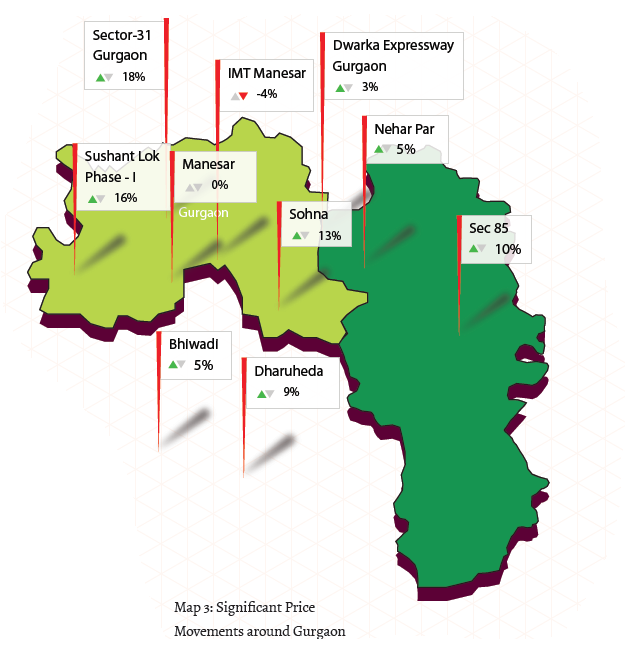 Some other localities in Gurgaon that fared high on the ROI chart include Sushant Lok Phase-I (16 per cent), Sector-68 and 59 that rose by 15 per cent each and Sohna that rose by 13 per cent. Interestingly, in Delhi, a lot of localities recovered from last quarter’s dip and showed good growth. Some of them include Paschim Vihar, Chattarpur, Vasant Kunj, Uttam Nagar, Rohini and Greater Kailash. Despite being secondary markets, these localities revived due to better investor sentiment in Oct-Dec 2014 in comparison to the last quarter. For Ghaziabad where even the popular trans-hindon localities saw a fall in property prices last quarter, this quarter was rewarding. While both Kaushambi and Vasundhara witnessed seven per cent capital appreciation, housing prices in Vaishali and Indirapuram jumped up by five and four per cent respectively. The presence of growth drivers such as metro and proximity to NH 24 and Anand Vihar ISBT can be attributed to the popularity of these localities among both end users as well as investors. The two national highways crossing Ghaziabad, NH- 24 and NH-58 witnessed a jump of almost seven and nine per cent respectively in the prices of residential apartments mainly due to key policy announcements including widening of NH-24 and affordable housing options on NH-58. 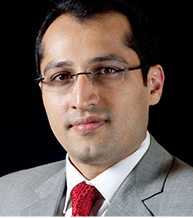 Sector 131 emerged as the front-runner in Noida with 12 per cent growth in capital values. 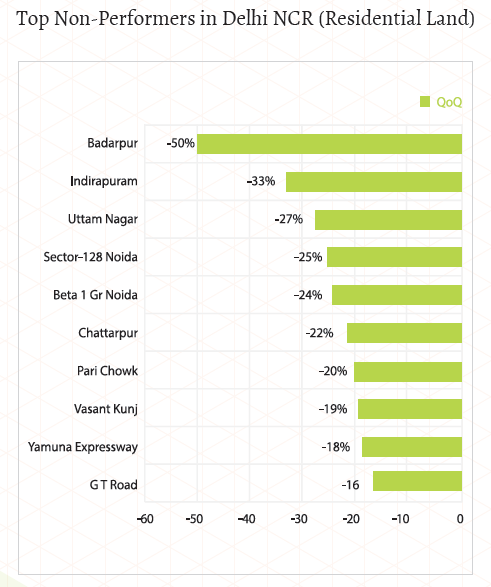 Apart from this, most sectors falling along Noida-Greater Noida Expressway also gained this quarter majorly owing to their location and the infra developments happening around. For Greater Noida, the realty market has started moving now with most localities giving healthy returns. Apart from Surajpur, which performed the best in the entire Delhi NCR region, Sector 16, Sector Omicron, ZETA, Chi and Chi-Pi also saw good hikes in the prices of residential apartments. Cost efficiency, affordability and improving connectivity are seen as the growth stimulators here. Bhiwadi which suffered due to the overall slump in Delhi NCR last quarter, grew by 5 per cent in Oct-Dec 2014. The sub-city along with Dharuhera are growing as economical investment zones. The supply equation in Delhi remained unchanged with builder floors being the most supplied property type followed by society apartments in Oct-Dec 2014. Within builder floors, ready to move in 3BHK emerged as the most supplied unit. For all other pockets in Delhi NCR, the number of under-construction society apartments were higher than all other property types. Scanty land parcels in Delhi have opened doors for micro-markets in NCR that are becoming favored choices for investing in residential land. 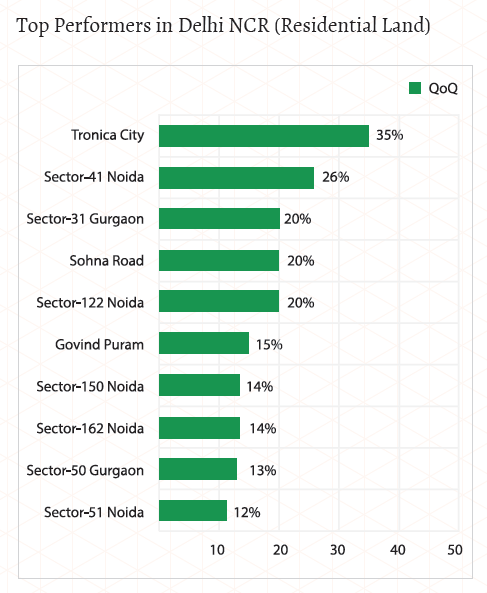 As a result, while Tronica City and Govind Puram in Ghaziabad are among the top gainers; otherwise popular areas of South Delhi – Chattarpur and Vasant Kunj saw drops in the prices of residential land in Oct-Dec 2014 as against the last quarter. Tronica City in Ghaziabad has a total of 12 residential and eight industrial sectors. The UP government has allotted 2400 acres land for plotted development and is going to allot 1200 acres of additional land in the near future. The policy on freehold conversion of these plots and easy sale, purchase and transfer of land here by the State government has made it earn a profit of 35 per cent this quarter. Govind Puram in Ghaziabad also ranked as one of the top gainers in residential land category this quarter with a 15 per cent capital appreciation. Located on Hapur Road, the locality enjoys good connectivity with Noida, East Delhi and Ghaziabad through NH-24 and NH-58. It caters to the housing needs of those with limited budgets and offers a mix of society flats, builder floors, independent houses and plots. Demand from mid-income housing category and those working in the industrial zones nearby including Kavi Nagar, Buland Shaher and Meerut road keep the realty market buzzing. ">Other localities that witnessed price appreciation include Sector 41-Noida, Sector 31-Gurgaon and Sector 50-Gurgaon. 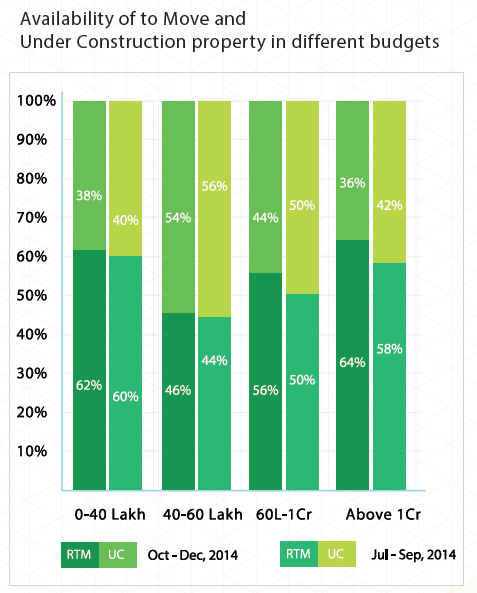 Price appreciation in these localities is attributable to increase in ‘ask’ prices by sellers, as well as good connectivity to adjoining localities. Land prices in Yamuna Expressway (also known as Taj Expressway) however fell down by 18 per cent majorly owing to the new Land Acquisition Act by Yamuna Expressway Industrial Development Authority’s (YEIDA) announced in July this year. The authority had allotted the residential plots scheme in 2009-10 but failed to hand over possession of these plots to allottees due to mass farmer protest. As per the new Act, if a farmer denies to accept compensation for his land, government will have to re-acquire the same land implementing 2013 Act. This has marred land rates in the area. Weak investor sentiments in case of residential land can be attributed to price depreciation in most localities including Najafgarh and Badarpur. Mayur Vihar Phase III has been the frontrunner in Delhi with an 18 per cent rise in the prices of residential apartments. The locality is situated close to Noida border and mostly consists of DDA society apartments. It has been climbing the growth ladder for the last one year majorly owing to sound infrastructure and competitive property prices than its adjoining phases – Mayur Vihar I and II. The newly emerging locality Aaya Nagar in South Delhi continues to see an upward movement in the prices of both builder/society flats and individual houses. This quarter, it earned an appreciation of three per cent. Having a metro station of its own–Arjan Garh has made it sit high on location attractiveness index. In addition to this, the area is witnessing a lot of civic reforms in terms of better service roads and drainage management. Prices of residential property in Chattarpur also jumped by nine per cent in Oct-Dec 2014. The area is one of the prime residential regions in South Delhi that witnesses great demand for high-income housing. Apart from this, Greater Kaislash II and Vasant Kunj in South Delhi also grew up on the ROI scale with eight and seven per cent capital appreciation respectively. Real estate experts feel that these areas will continue to see uptrend in prices because of inflating construction costs and circle rates. In North-West Delhi, Janakpuri, Paschim Vihar and Rohini fared among the top contributors with 11, nine and four per cent hike in property prices in the last quarter. While Janakpuri and Paschim Vihar are largely secondary markets with more supply for ready to move in and re-sale inventory; some sectors in Rohini are newly developed and seeing construction of a lot of builder floors. 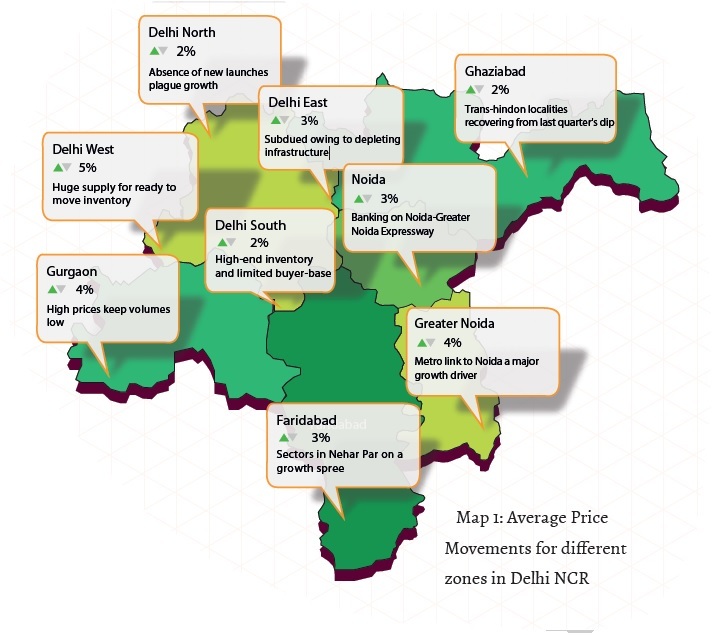 Most sectors in Rohini, especially Rohini sector 13, where prices have jumped by nine per cent in the last quarter, have an edge over most other localities in Delhi in terms of price competitiveness. Connectivity via metro is an added advantage too for these sectors. Most localities in East Delhi are facing tough competition from Ghaziabad where property is available at economical rates and infrastructure is continuously improving. As a result, IP Extension and Patparganj – two of the most popular residential localities here saw falls in property prices. Most sectors in the Dwarka sub-city fared among the top non-performing localities for Oct-Dec 2014. Previously inflated prices, price corrections and low sales volumes have led to a 16, nine and seven per cent fall in the property prices in Sector 16, 18 and 17 respectively in Dwarka. The presence of metro, wide roads and sound social infrastructure has not been able to pull up property prices. The rental markets of Saket in South Delhi, Paschim Vihar in North-West Delhi and most sectors in the Dwarka sub-city saw decent transactions this quarter (Oct-Dec vs Jul-Sep 2014). While rentals in Saket climbed by 19 per cent, those in Paschim Vihar rose by 18 per cent. Sectors 13, 18 and 19 in Dwarka saw an increase of nine per cent each in the rental rates. Presence of civic amenities and metro in all these localities make them popular among the masses for rented accommodations. The uptrend in rental rates in Dwarka can be attributed to the presence of as many as 10 metro stations and price competitiveness in comparison to other established localities in Delhi. In East Delhi, Mayur Vihar Phase 1 witnessed a 10 per cent increase in rental rates. The locality is among one of the favored ones for rental accommodations due to its proximity to Noida and Ghaziabad and also due to the presence of sound social as well as physical infrastructure. The sector mostly consists of DDA apartments and has a sound security system in place. Amenities like markets, schools and public parks are ample. Kirti Nagar in West Delhi also saw an 11 per cent hike in the rental rates. The locality constitutes builder floors and independent houses and is popular among migrant students and working individuals as it has a metro station of its own. Localities in Delhi that saw a fall in the rental rates include Vasant Vihar and Hauz Khas in South Delhi and Pitampura and Rohini in North-West Delhi. The drop may be attributed to corrections in previously inflated rental rates in these areas. Supply of affordable housing options in Delhi has gone up by 120 per cent in the last one year owing to huge demand for this category. Interestingly, the total supply for high-income housing segment has also gone up by almost 65 per cent due to inflating construction costs in some regions. 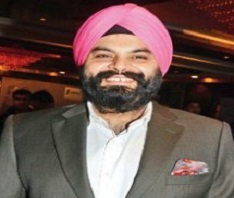 Builder floors have dominated property supply in Delhi with the current quarter reflecting a 50 per cent share. Builder floors were followed by society apartments (47 per cent) and independent houses or villas (just 3 per cent). Interestingly, the abundant supply of builder floors is owing to the floor based system that is prevalent in Delhi. A low rise by an independent builder/owner can comprise of multiple floors that can have multiple owners. There have been insignificant changes in the supply of builder floors in the last quarter compared to the previous one. However, annual numbers reveal the total supply of builder floors in Delhi has risen by almost 5 per cent. Due to absence of new launches in the region, number of society apartments are far lesser in number than builder floors and independent houses. Developers focus more on peripheral areas like Greater Noida, Ghaziabad, Bhiwadi and Dharuhera where land cost is economical and demand for society apartments is higher. 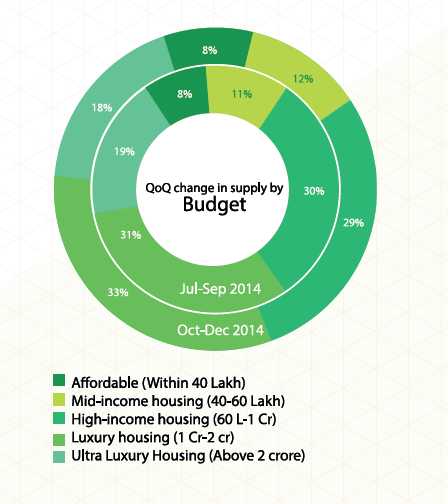 High construction costs and inflated circle rates have led to high income segment being the most supplied in Delhi. Majority of residential units available fall in the price range of Rs 60 lakh-1 crore, reflecting little change from the previous quarters. An annual comparison reveals that total supply for high-income housing segment in Delhi has gone up by almost 65 per cent. Interestingly, the supply for affordable category in Delhi (property priced within Rs 40 lakh) has gone up by 120 per cent in the last one year. There has been a 15 per cent increase in the supply of residential units priced over Rs 1 crore in the last one year (Oct-Dec 2013 vs Oct-Dec 2014). If one looks at the property priced within Rs 40 lakh in Delhi, most of the supply (over 80 per cent) is under construction. This could be owing to new projects launched in affordable localities of Delhi. 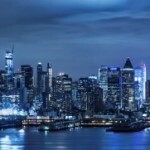 The scene, however, is quite different for all other budget categories wherein most of the property supply is ready to occupy and a small share of inventory is under construction. For property ranging above Rs 40 lakh, over 80 per cent is ready to occupy with most of it being re-sale property and only 15-20 per cent is under construction property. This indicates that Delhi has limited options for under construction or new property for mid, high and luxury housing segments. 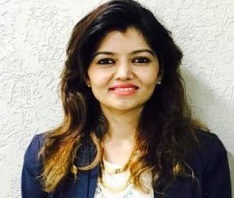 This could be the reason for investor interest shifting towards adjoining areas like Ghaziabad, Greater Noida, Bhiwadi and Dharuhera that are emerging as new growth corridors due to a lot of builder action and under construction inventory that leaves scope for earning profits on investments. Quarter-on-quarter numbers for under construction versus ready to move inventory hardly shows any changes as the equation has had always remained same in Delhi’s case. For the quarter ending December 2014, 3BHK emerged as the most supplied unit for builder floors and society apartments in Delhi followed by 2 BHK, 4 BHK and 1 BHK. The trend has remained same in Delhi for years owing to the preference given to more spacious apartments. An average 3 BHK in Delhi measures around 1300-1600 sq ft and a 2 BHK around 900-1200 sq ft.
Delhi is primarily a resale market because of hardly any new project launches. Within the 3 BHK category, more than three quarters is ready to occupy and the remaining is under construction. Interestingly, even the least supplied unit i.e. 1 BHK has 90 per cent as ready to move and just 10 per cent under construction inventory. Quarter-on-quarter comparison reveals that the supply of ready to move in 1BHK units have gone up by four per cent and the number of ready to move 4BHK units have gone up marginally by two per cent. Subsequently, supply of under construction 1BHK units has gone down by four per cent while that for 4BHK units has dropped by two per cent. For 2BHK and 3BHK units, the equation did not alter in this quarter. The realty atmosphere in Noida, Greater Nodia and Ghaziabad was rewarding for most of the prominent and even newly emerging localities this quarter. Affordable regions have emerged as profitable ones and frontrunners include Surajpur in Greater Noida, Sector 131 in Noida and NH-58 in Ghaziabad. Surajpur in Greater Noida emerged as the most profitable investment zone in this pocket owing to the industrial development happening around that is leading to a rise in demand for affordable residential inventory. With 20 per cent capital appreciation in Oct-Dec 2014 as compared to Jul-Sep 2014, a society apartment in Surajpur is now available at Rs 3000 per sq ft. The presence of UPSIDC – the state agency for developing industries and industrial infrastructure – is one of the major growth drivers for Surajpur. Located on Noida-Greater Noida Expressway, Sector 131 is one of the prime residential localities in Noida. Presence of good civic and social infrastructure like well-known schools and markets in the vicinity and smooth connectivity to Delhi and Greater Noida through the 8-lane expressway places it well on location attractiveness index. Capital prices in the sector jumped by 12 per cent this quarter. Most other sectors located across the Noida-Greater Noida Expressway have performed well in Oct-Dec 2014 majorly owing to their location and the sound infrastructure that the entire stretch has. 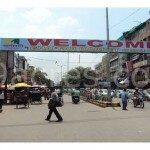 In Ghaziabad, NH-58 has been among the frontrunners with close to 10 per cent appreciation in property prices. Proposed connectivity with NH-24 and extension of Delhi metro are the major growth drivers for localities built along the highway. Interestingly, capital rates in Govind Puram recovered post a 2-year long decline. 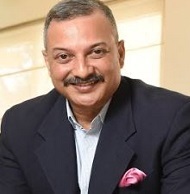 Improving infrastructure and connectivity links including proposed extension of NH-58 are responsible for a nine per cent capital appreciation this quarter. Capital rates in Kaushambi and NH-24 also jumped by seven per cent each due to no known reasons apart from the overall improved realty atmosphere in Delhi NCR. Noida Extension (Greater Noida West) that had been plateauing for over a year jumped by five per cent this quarter. This surge is seen as the result of Greater Noida Authority’s announcement of acquiring 156 hectares in Shahberi - the village at the heart of the land crisis that gripped Noida Extension three years ago. The Authority is likely to complete the re-acquisition within two months. 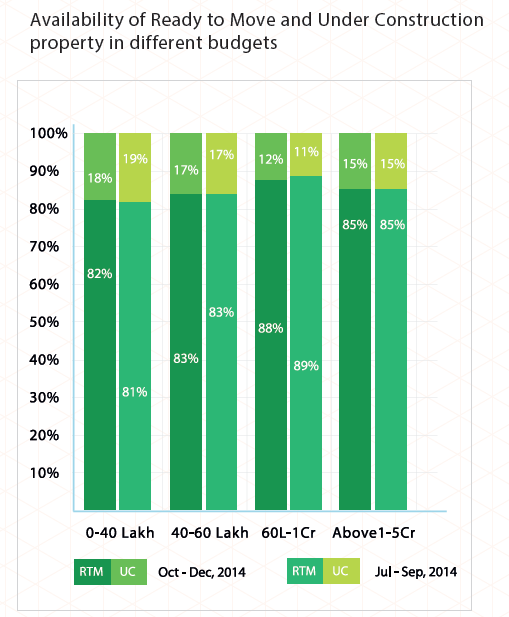 Localities that did not perform well on the ROI scale this quarter include NH-91, Lal Kuan and Bhopura in Ghaziabad, Sector 168 in Noida and Knowledge Park III in Greater Noida. While Knowledge Park III saw minor some price corrections (two per cent), capital rates fell in NH-91, Lal Kuan and Bhopura due to slow pace of infra developments. Sector 168 in Noida which houses projects by some of the most well-known builders witnessed a seven per cent depreciation due to low sales volumes in the sector. Rentals in Sector ZETA and ZETA I in Greater Noida appreciated by 33 per cent each due to supply of low cost furnished as well as un-furnished apartments on rent. Rentals in Ahinsa Khanda and Ahinsa Khand 2 in Indirapuram jumped by 18 and 20 per cent respectively. These sectors are located near NH-24 that provides easy connectivity to most areas in Delhi and Noida. Presence of good civic amenities including market places, schools and public transport also makes Indirapuram a preferred locality for rented accommodations. Raj Nagar Extension in Ghaziabad also fared well in terms of rental appreciation and rates here grew by 17 per cent. In other words, a 1000 sq ft apartment that cost Rs 6000 in Jul-Sep 2014 now costs around Rs 7000 per month. For Noida, sectors near Noida- Greater Noida Expressway gained in terms of rentals this quarter majorly owing to the location, connectivity and the improving infrastructure in terms of presence of schools, offices and colleges on both sides of the Expressway. As a result, rental rates in Sectors 137, 121, 120 and 110 increased by 5 per cent-10 per cent. 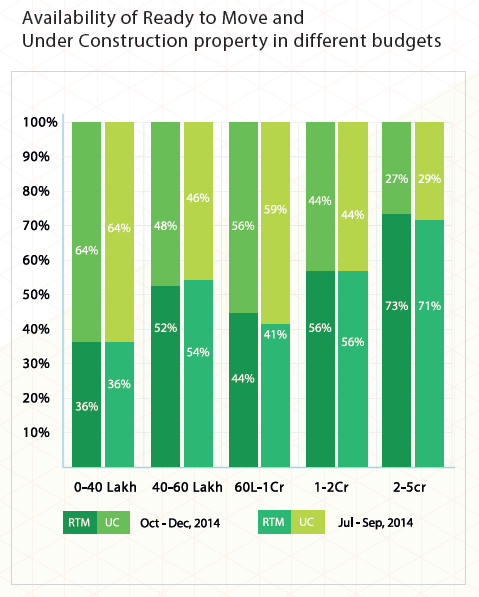 With the supply of residential apartments increasing by 10 per cent in Oct-Dec 2014, under-construction inventory in Noida, Greater Noida and Ghaziabad is on a rise. 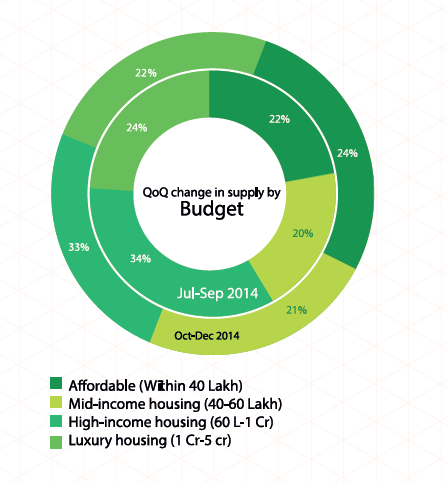 Notably, 35 per cent of the total property supply in these pockets falls in the affordable housing segment. Society apartments continue to be the most supplied property type in all three pockets – Noida, Greater Noida and Ghaziabad in comparison to builder floors and independent houses/villas. Quarter-on-quarter comparison reveals that the number of residential apartments in these three pockets have gone up by 10 per cent. Annual comparison reveals that the supply of apartments has gone by 15 per cent owing to a number of new project launches in the last one year with Greater Noida West. A slight decrease in the supply of ready to move in residential apartments reflect that fewer projects have been delivered this quarter versus the previous one. Though there are insignificant changes with respect to percentages in the supply of builder floors during this quarter versus the previous one, the number has doubled in the last one year. This could be due to the rising demand of affordable property in these areas. Independent houses or villas however are the least supplied property type as they cater to the luxury segment needs and these pockets witness more demand from low-income and mid-income housing segments. Noida, Greater Noida and Ghaziabad cater to the affordable segment category the most with 35 per cent of its supply within Rs 40 lakh. Out of these three, Greater Noida has the maximum supply of apartments in this range (43 per cent), followed by Noida (29 per cent) and finally Ghaziabad (28 per cent). More than a quarter of the supply of residential apartments in these three pockets fall in the mid-income housing (Rs 40-60 lakh) category. Of these three, Noida has almost half of the supply and the remaining two areas - Greater Noida and Ghaziabad have 25 per cent supply each for this budget range. Only a quarter of the total supply of residential apartments in these areas falls in the high-income housing (Rs 60 lakh- 1 crore) category. It is notable that Noida has the maximum share of supply for this budget category with 60 per cent of its residential apartments in the range of Rs 60 lakh-1 crore. This is followed by Ghaziabad with a 30 per cent and Greater Noida with just 10 per cent supply share. Unlike Gurgaon, Noida, Greater Noida and Ghaziabad cater more to the budget housing needs and thus has limited supply (14 per cent of the total apartment supply) for the luxury housing segment, which ranges above Rs 1 crore. It is notable that 70 per cent of the supply of residential apartments in Noida is currently under construction and only 30 per cent is ready to move in. This indicates that a lot of inventory is going to be available in 3-4 years from now. The picture is similar for Greater Noida with its share of 75 per cent of under construction and only 25 per cent ready to move in inventory. For Ghaziabad, however, the ready-to-move versus under construction inventory equation is different from the other two regions. Since most of the Trans Hindon localities are well-developed, 60 per cent of the property supply is ready to occupy and the rest 40 per cent is under construction. Quarter-on-quarter analysis shows the maximum supply for both ready to move in and under construction inventory for apartments, builder floors and independent houses fall in the affordable housing segment (< Rs 40 lakh). 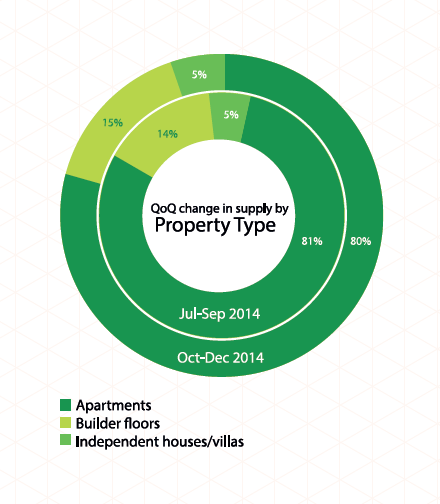 From Jul-Sep 2014 to Oct-Dec 2014 quarter there has been a 2 per cent increase in supply of the ready to occupy inventory and a subsequent 2 per cent decrease in the supply of under construction inventory. This is majorly due to more project completions and fewer project launches in the last quarter. A few developers in these areas are launching luxury and ultra-luxury projects, hence 4BHK and 5BHK are not among the favored units and thus have limited supply. 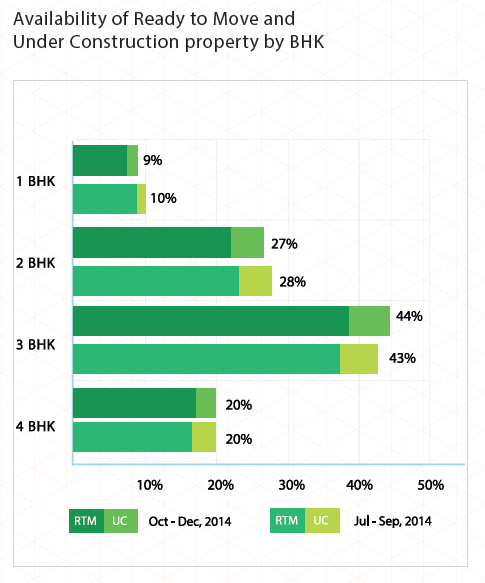 For Oct-Dec 2014, 2 BHK is the most supplied unit (48 per cent) in Ghaziabad followed by 3 BHK (34 per cent), 1BHK (12 per cent) and 4BHK (6 per cent). With more than 45 per cent share in the supply of apartments, 2 BHK is also the most popular unit in Greater Noida followed closely by 3 BHK (36 per cent). In Noida however, 3 BHK is more popular than 2 BHK with close to 45 per cent supply share. 2 BHK follows closely with a 40 per cent share. Though low sales volumes for high-end properties in Gurgaon kept the market pensive, property prices continue to trot up due to increasing construction costs and circle rates. Bhiwadi and Dharuhera revive due to planned industrial and infrastructural development in the satellite towns. With over 18 per cent capital appreciation, Sector 65 topped the list of best performing localities in Gurgaon. Located along the Golf Course Extension road and close to Sohna Gurgaon road and NH-8, the sector not only has an edge over others in terms of connectivity to Delhi and others parts of Gurgaon but also has a sound infrastructural set up. It is seen as one of the fastest developing residential sectors in Gurgaon. 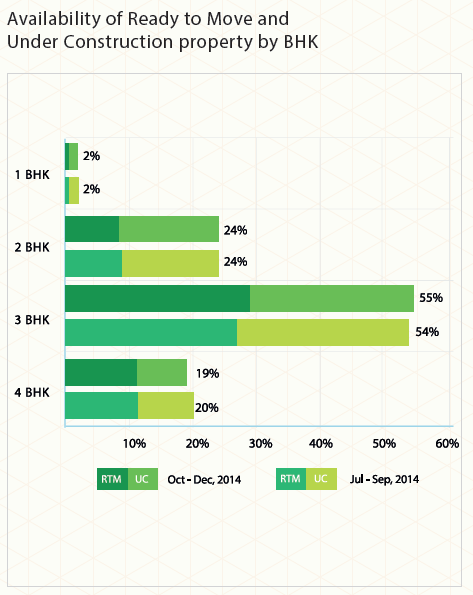 Property prices in Sushank Lok Phase 1 jumped by 16 per cent in Oct-Dec 2014 as against the previous quarter. Mostly consisting of plotted development with independent builder floors, the locality is 5 km from Huda City Centre metro station and enjoys good connectivity to Delhi and other regions in Gurgaon via NH-8. 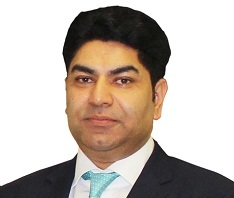 Sohna continues to deliver good returns and has yielded a profit of 13 per cent in the last quarter mainly due to the infra developments subsequent to the announcement of a separate Sohna Master Plan-2031 that was notified in 2013. The sub-pocket benefits from good connectivity with the prime locations of Gurgaon, Delhi and Faridabad and caters to the spill-over demand from Gurgaon. Capital rates in Bhiwadi and Dharuhera jumped by six and nine per cent each. Affordability, connectivity, and upcoming industrial and infrastructural developments including widening of NH-8 and bullet Train linking Alwar- Delhi-Panipat-Meerut from Dharuhera are making these pockets investment hot spots. Sectors on a growth radar in Faridabad include Sectors-80, 86 and 81. All these fall under the Nehar Par area where major policy announcements including the upcoming Faridabad-Nehar Par-Gurgaon Expressway, Eastern Peripheral Road and Western Peripheral Road have positively impacted the realty market. Capital appreciation in these sectors can also be attributed to the extension of Delhi Metro from Badarpur to YMCA Chowk that is expected to get operational in May 2015. Prices of residential apartments in IMT Manesar dipped by four per cent in the last quarter and hardly witnessesd any hike in the last one year (only 1 per cent). The land acquisition row between farmers, builders and the Haryana Government in addition to civic woes such as lack of arterial roads and erratic power supply have contributed to this de-growth. In Gurgaon, DLF City Phase IV topped the list of highest gainers in terms of rental appreciation. With close to 80 per cent growth in the rental rates, the locality now has a 2000 sq ft apartment available at Rs 46000 per month. This was followed by Sector-46 in Gurgaon. The sector is located adjacent to Cyber Park and hence demand from working migrants keeps increasing. 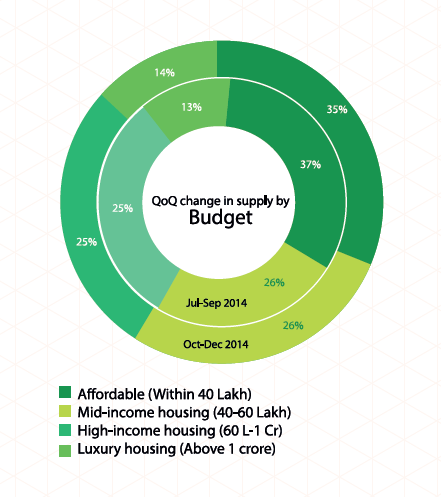 This has resulted in 58 per cent hike in rentals in Oct-Dec 2014 as against the previous quarter. Rental rates for localities along NH-8 continue to trend up owing to easy connectivity via the highway. Huge demand for affordable rental accommodations from working population in Gurgaon keep the rental markets of neighboring sub-cities Bhiwadi and Dharuhera vibrant too where one can get a 2bhk for Rs 8,000- 10,000 per month. Sectors that witness high demand for rental spaces in Fariadabad include the ones close to Delhi and the main bypass road such as Sectors-76, 86 and 87. With metro connectivity from Badarpur to Central Secretariat and metro line till YMCA Chowk going to be operational in May 2015, Faridabad is going to be few minutes from Nehru Place, Jor Bagh and most other places in South Delhi. Improved connectivity is the reason why both demand and rental rates in Faridabad are on a rise. Society apartments continue to have the most supplied property type in both Faridabad and Gurgaon. While the supply of affordable properties in Gurgaon saw a surge this quarter, the numbers remained same for Faridabad that continue to supply mid-income housing options the most. Society apartments are the most supplied property type in Gurgaon and Faridabad followed by builder floors and independent houses/villas. In Faridabad, residential apartments have more than half of the share in the total property supply. 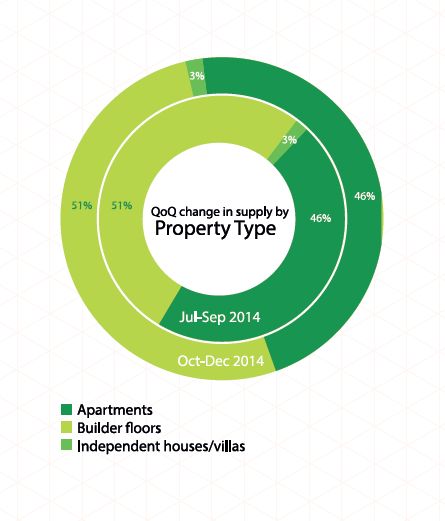 Independent houses/villas are very few in numbers and builder floors have less than half of the total supply. 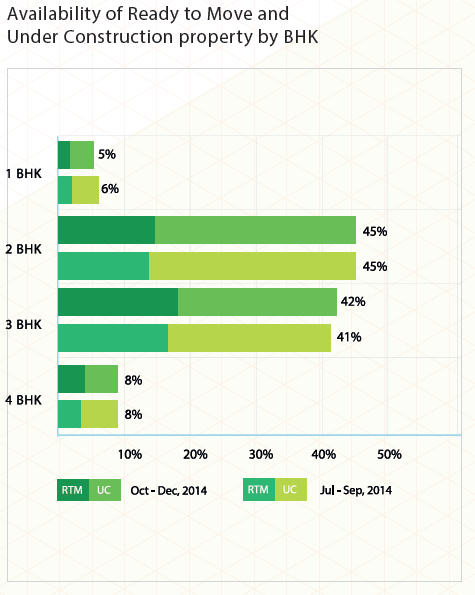 For Oct-Dec 2014, society apartments have had the maximum share of supply in Gurgaon, followed by a very low percentage of builder floor supply and an even negligible share of independent houses/villas. There have been insignificant changes in the supply of different type of properties in Gurgaon and Faridabad in Oct-Dec 2014 quarter as against the previous one. Due to high construction costs and inflated property rates, most properties in Gurgaon fall in the luxury housing segment. In other words, almost 60 per cent of the properties in Gurgaon are priced as Rs 1 crore and above. Only a quarter of total supply of property in the pocket falls in the high-end housing segment which is priced between Rs 60 lakh and Rs 1 crore. As is evident from the numbers, a very insignificant portion of the total supply of property in Gurgaon falls in the affordable and mid-income housing category. In Faridabad, however, the property segregation on the basis of budget is quite different from Gurgaon. Mid-income housing (Rs 40-60 lakh) and high-income housing (Rs 60 lakh-1 crore) have equal shares in the total property supply. Even affordable housing supply, i.e. the property priced within Rs 40 lakh has a 20 per cent share and luxury housing supply, i.e. property priced above Rs 1 crore is the least (only 10 per cent) supplied. There have been no major changes in the supply figures for both under construction and ready to occupy property for Gurgaon and Faridabad. This could be because of fewer deliveries as well as fewer product launches this quarter. Affordable and mid-income housing categories (property falling within Rs 60 lakh) have the maximum supply of under construction category. This could be due to the launch of some affordable projects in Gurgaon in the last one year. And since all these projects are new, supply for ready to move in inventory in these categories is below 20 per cent. Gurgaon has wholesome supply of ready to move in inventory in the high income and luxury housing categories. In Faridabad, properties priced within Rs 40 lakh have an equal supply of ready to move in and under construction inventory. However, almost three quarters of the total supply of properties priced in the range of Rs 40 and 60 lakh are ready to occupy. The high-income housing and luxury housing segment also majorly consists of ready to move in apartments and builder floors. 3 BHK is the most supplied category in Faridabad and Gurgaon, followed by 2 BHK, 4 BHK and 1 BHK. Within 3 BHKs, ready to move in inventory is slightly more than under construction apartments. 1 BHK units are almost nominal in numbers in both Gurgaon and Faridabad. This could be due to low demand for these units for both sale and rental purposes. More than half of the 2 BHK units in Gurgaon and Faridabad are under construction indicating that the supply for these units will increase considerably in the coming 2-4 years when these projects would get delivered. 4 BHK units on the other hand have lesser under construction inventories than ready to move in ones due to frail demand as well as supply for these units. 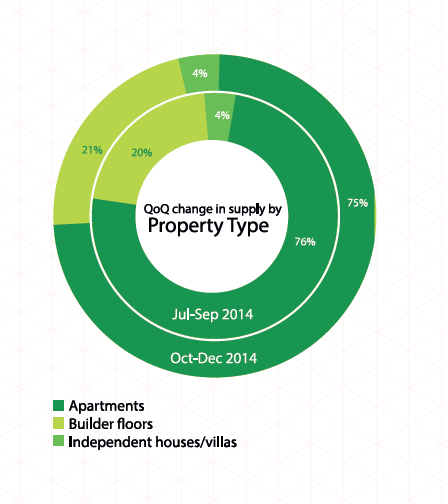 Quarter-on-quarter comparison shows that there have been insignificant changes in the supply of ready to move in and under construction inventory in Gurgaon and Faridabad for all units in the Oct-Dec 2014 as compared to the previous quarter. The equations in both these regions remain constant due to the inherent nature of these realty markets. You’ve really captured the essence in this subject area, haven’t you? Wonderful story, reckoned we could combine a handful of unrelated data, nonetheless genuinely worth taking a look. Wonderful story, reckoned we could combine a few unrelated data.